This is a wonderful, and simple recipe that can be used either for dinner or make smaller ones for serving to guests at a party or buffet table. They are great with or without the cranberry glaze. The recipe for the cranberry glaze is below. Cook ground pork until cooked through. Drain and transfer to a large mixing bowl. Add dry stuffing mix and combine well. Place in a lined cookie sheet. Brush the tops of the balls with melted butter. Bake at 325F for 20 minutes, until cooked through and golden brown. They can also be served with this wonderful cranberry glaze if desired. Combine all ingredients in a sauce pan. Cook until heated and everything has been combined. 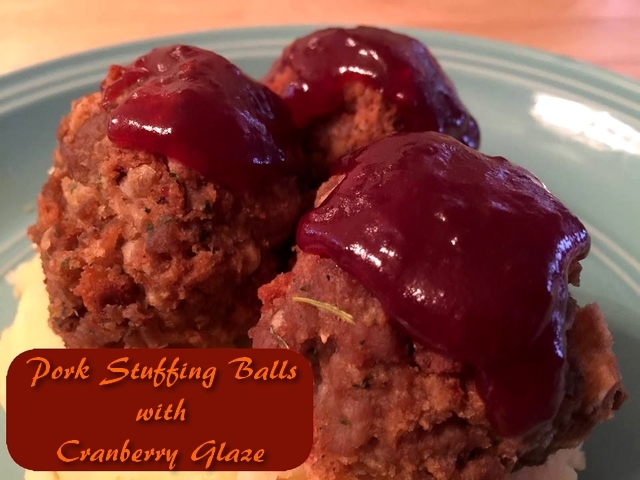 Serve over pork stuffing balls.